Given less opportunity to hunt for seals, bears are turning to alternative prey to offset nutritional shortfalls. Eggs of colonial nesting birds are on such alternative prey item. 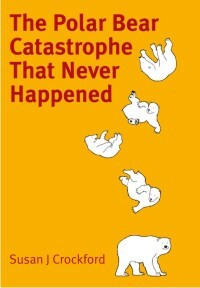 Bears have long been known to eat them, but the paper concluded that the behaviour is on the rise. Figure 2. The study area of this paper (Fig. 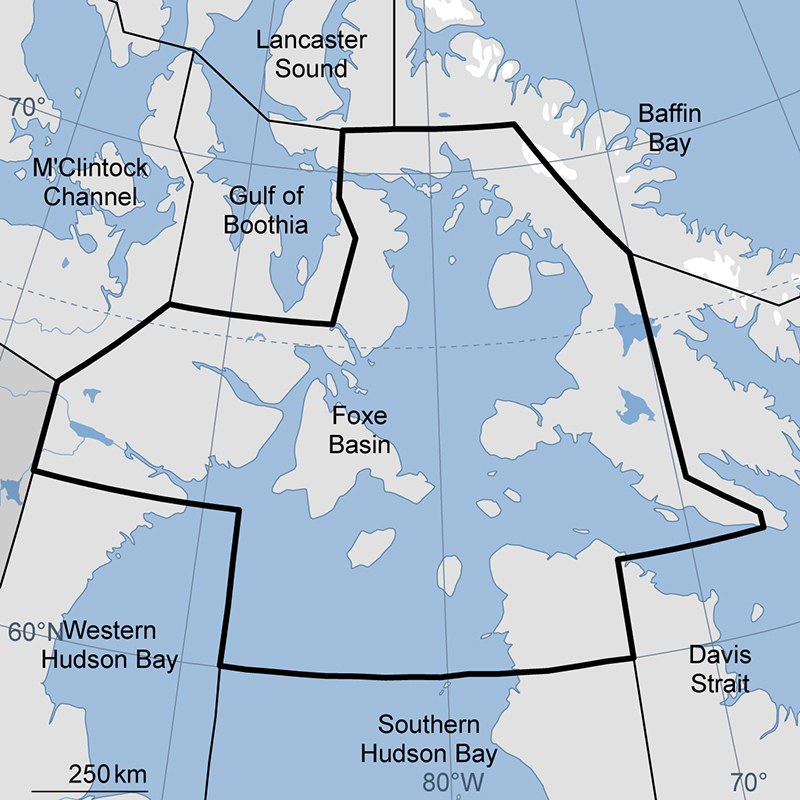 1) covers parts of the Foxe Basin polar bear subpopulation and the southern portion of the Davis Strait subpopulation that spends summers on the Northern Labrador coast and the southeast shore of Baffin Island. Courtesy IUCN Polar Bear Specialist Group. 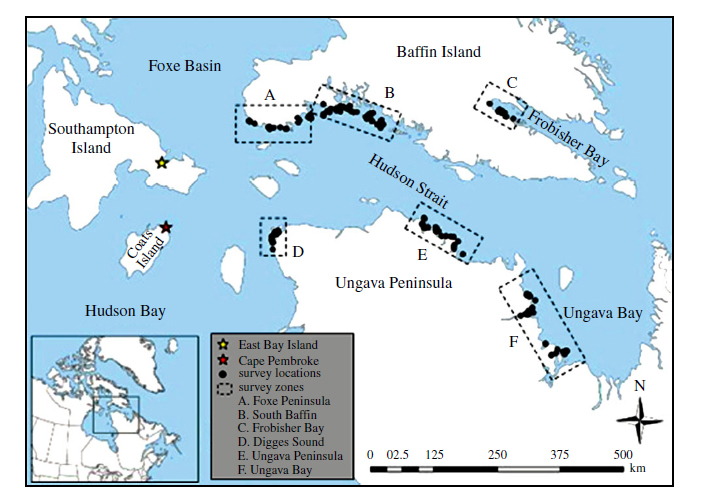 There were three parts to this study: 1) a long-term survey of one common eider colony and 2) one thick-billed murre colony (16 and 20 years, respectively) in Foxe Basin, and 3) a recent three year survey (2010-2012) of a larger area that included Hudson Strait (areas “A-F” in Fig. 1). Oddly, despite the fact that the researchers collected data on sea birds in mid-summer (mid-June to mid-August), they used a sea ice metric (“ice season length, # days with ice cover >30%”) for the entire winter-early summer sea ice season rather than breakup dates associated with each summer’s breeding season. “The colony is situated in a protected bay that is seasonally covered with landfast sea ice that typically melts several weeks later than the sea ice in surrounding, more open water areas. That fact that this region routinely retains sea ice longer than others during the breakup period in mid-summer means bears will be attracted to the lingering ice as a hunting platform, putting them conveniently close to ground-nesting eiders once the ice finally melts. Sound like a less than ideal location for the eiders. So what does the data they collected look like? The sea ice data for East Bay Island is presented in the published paper while the “polar bear presence on the colony” data is in one of the supplemental data files. Because few people ever bother to examine supplemental files, I’ve combined them into one image so they can be more easily compared (Fig. 3). Looking at the two graphs one above the other, I noted the following: 2009 had a relatively long ice season with a relatively high bear presence (although not as high as 2011, which had a short ice season). Conversely, 2005 had an ice season almost as long as 2009 but relatively low bear presence. In 2006, the ice season was longer than 2007 (which was a low ice season) but had exactly the same number of days with bears present. While there is indeed an overall trend in both data sets over time there is little year-to-year correlation of ice season length with polar bear presence on the eider colony. This suggests that any “correlation” the authors found is due to the magic of statistics, not a biologically meaningful relationship. Cape Pembroke is on the north end of Coates Island in Foxe Basin and hosts a cliff-side colony of thick-billed murres. As for the East Bay data, I put Iverson and colleagues’ Cape Pembroke thick-billed murre data alongside their sea ice graph, with a similar result (Fig. 4 below). As for East Bay, the data indicate no year-to-year correlation of ice season length with polar bear presence. The only marked increase in bear sightings was confined to 2010 and 2011 – two years out of 20. Figure 4. Two graphs from Iverson et al. 2014. Top (their supplemental Fig. 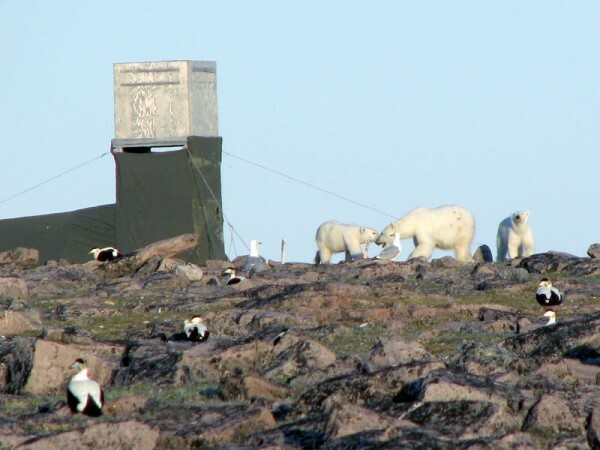 S3b): “the number of days on which one or more polar bears was sighted at the Cape Pembroke thick-billed murre colony,” 1988-2011. That could be the same bear sighted every day over that period or several sighted on multiple days. Bottom (their Fig. 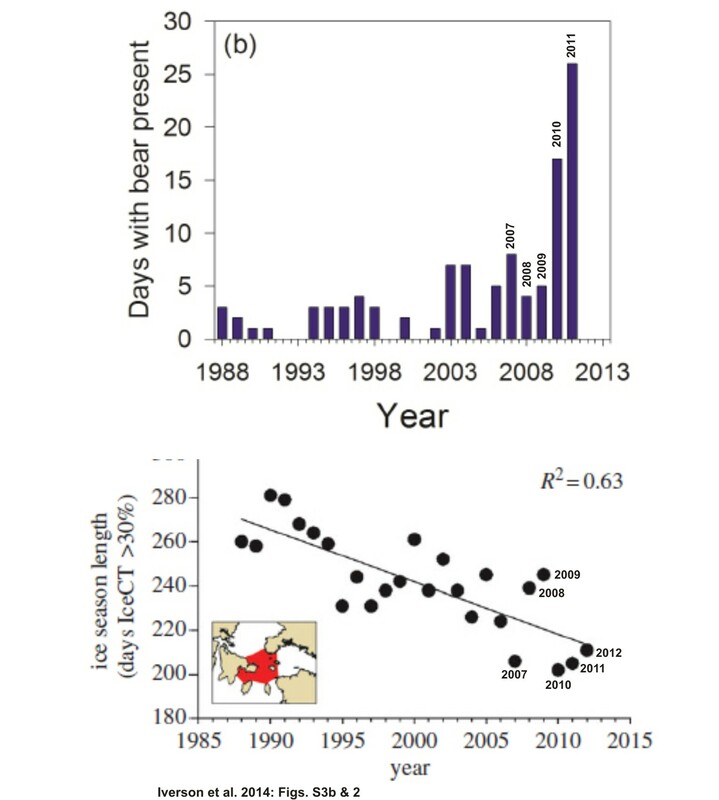 2): “decline in annual sea ice coverage in Northern Hudson Bay Narrows” for 1988-2012 (days with >30% ice). While there is a trend in both data sets, note the lack of a consistent correlation between length of ice season (bottom) and polar bear presence (top) year-to-year, especially for 2007 vs 2011. 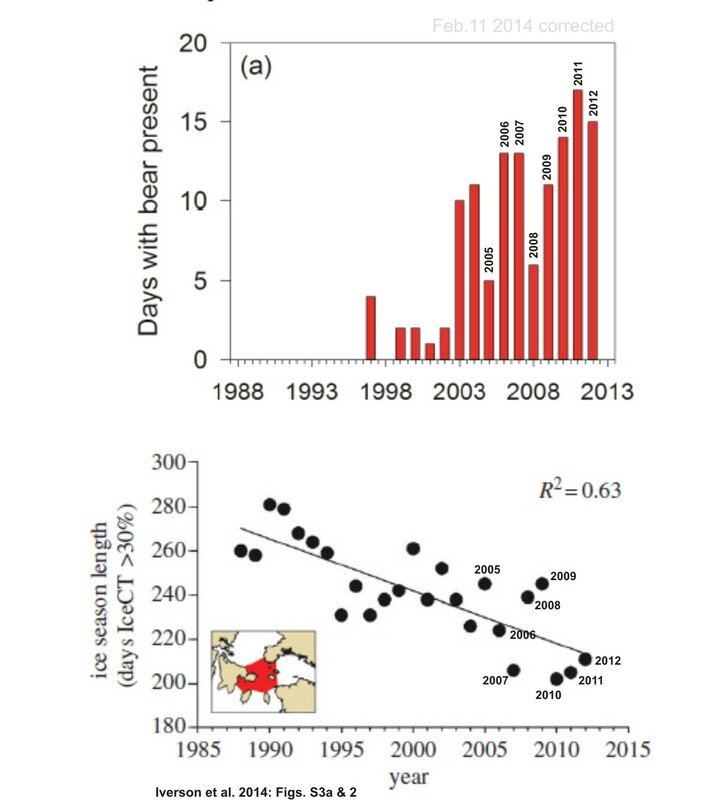 The real increase in bear sightings was confined to 2010 and 2011 – two years out of 20. During this survey, the bird researchers counted only 22 bears (including four cubs, Fig. 5) on 16 out of 230 island colonies (which is one bear, or a female bear plus one or two cubs, per island). The rest of the evidence of bear “presence” is indirect (feces, tracks, fur). There appeared to have been no attempt to discover if any of the indirect signs of polar bear presence could have come from the same bear visiting several adjacent locations. Figure 5. Fat female polar bear and her two fat cubs on the East Bay Island eider colony. A cropped version of this photo appears as part of Fig. S1 in Iverson et al. 2014 (this version is from the Science story). Steve Marson photo. Figure 6. 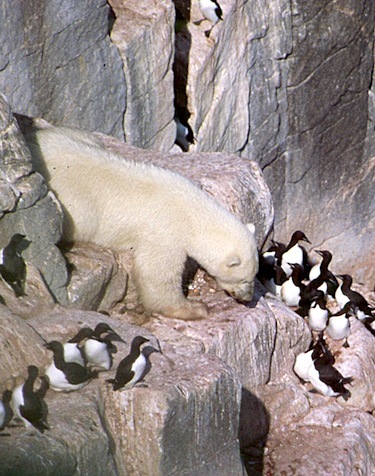 Healthy-looking polar bear at the Cape Pembroke thick-billed murre colony on Coates Island. This photo appears as part of Fig. S1 in Iverson et al. 2014 (this image appeared in a related NunatsiaqOnline story, 8 August 2013). Kenny Woo photo. Where did Iverson and colleagues get the idea that Foxe Basin and Southern Davis Strait bears were nutritionally stressed (or as they put it: “experiencing difficulty meeting their energetic demands” and “turning to alternative prey to offset nutritional shortfalls“)? They couldn’t have gotten the idea from Rode et al. 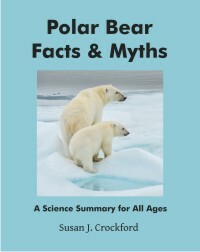 (2014), who reported that both male and female bears in Foxe Basin were heavier than all other subpopulations examined, including Chukchi Sea bears — who were found to be in excellent condition and reproducing well (see Fig. 7 below). Figure 7. 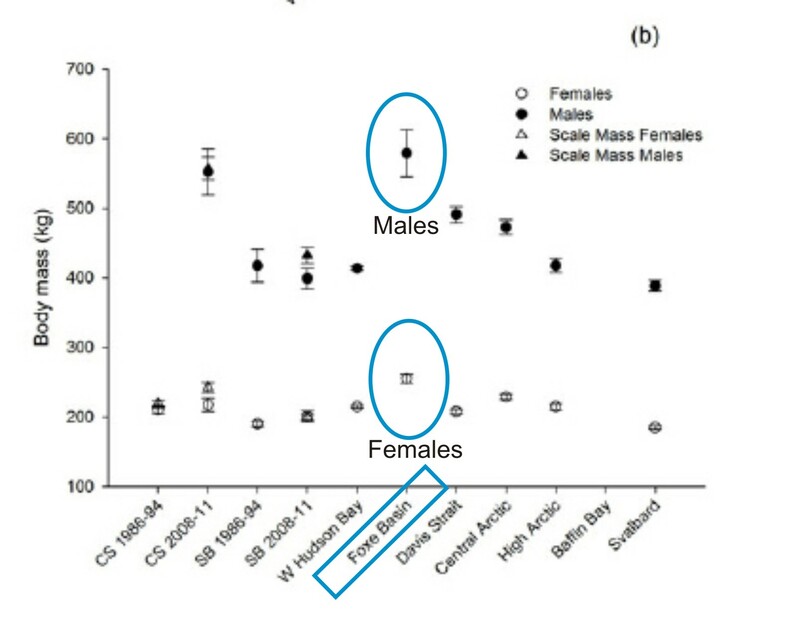 Weight of Foxe Basin male and female polar bears (circled by me) compared to other populations measured. CS, Chukchi Sea; SB, Southern Beaufort; Central Arctic = parts of Gulf of Boothia and M’Clintock Channel; High Arctic = Lancaster Sound. This is figure 5b from Rode et al. 2014. That’s right – the authors used an assumed correlation rather than published observations available for bears in their study area. Iverson and colleagues did not cite either Rode et al. 2014 or Peacock et al. 2013. There is no doubt that both common eider and thick-billed murre colonies in Foxe Basin and southern Davis Strait are occasionally depredated heavily by polar bears and that some colonies have suffered high losses. Beyond that, the authors are out on a limb with the most publicized of their conclusions. The fact is, their results show nothing of the kind. 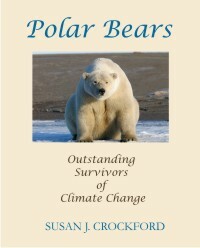 This entry was posted in Conservation Status, Life History, Sea ice habitat and tagged alternative prey, Davis Strait, Foxe Basin, Gilchrist, Hudson Strait, Labrador, nutritional stress, Peacock, polar bear, Rode, Samuel Iverson, sea bird eggs, sea ice decline, starving polar bears, terrestrial foods. Bookmark the permalink.